Fort St. Clair will be transformed into a Winter Wonderland in the month of December with millions of Christmas lights at this annual event. Whispering Christmas is open nightly through Dec. 31. There is no cost for admission, but donations are much appreciated. Santa’s Cabin is open nightly leading up to Christmas Eve from 6-10 p.m.
EATON — Whispering Christmas at Fort St. Clair is under new leadership this year. 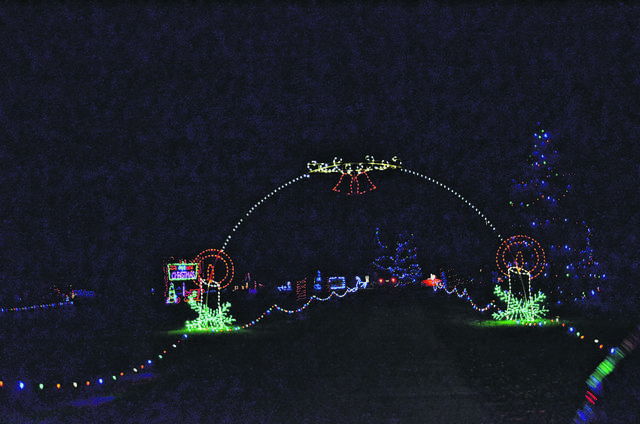 Committee Co-Chairs Amber and Lewis Willeford are working hard to make changes to the light show, while maintaining the same level of satisfaction it has brought in the past. Unfortunately, due to weather and unforeseen circumstances, the Whispering Christmas Committee is working on a shorter schedule this year. Instead of six weeks to prepare, they only had four. Even with the shorter preparation time, Whispering Christmas is up, running, and better than ever. One new implementation is the Battle of the Businesses. In an effort to get more of the community involved, the committee reached out to different businesses to see if they would be interested in decorating parts of the Fort. Silfex, Reid Health Urgent Care of Eaton, Parker Hannifin, and Henny Penny all answered the call. Attendees will be able to vote online on what business they think decorated the best. The winner will receive a traveling trophy and bragging rights. Pay attention to the business names listed on certain sections and stay tuned to the Whispering Christmas Facebook posts to vote for a favorite business. Neaton Auto was unable to get enough volunteers, but they did donate money instead. There has already been some interest in the Battle of the Businesses for next year. In the future, different groups and organizations will be able to participate as well, not just businesses. To organize Santa’s Cabin, which can get hectic on the weekends, the committee has made a designated Santa line. Starting outside and entering the cabin on the side, the Santa line will take kids and their parents directly to the Jolly Old Elf. The Santa line will deposit kids out to the refreshment area. If attendees are not interested in seeing Santa and simply want refreshments, they can enter the main door of the cabin. There are posted signs that will help direct traffic. “We were trying to get more organized, because on busy nights it was very confusing about where the Santa line was,” Lewis Willeford said. “On Facebook, that was one of the things that showed up every year since we started the page four years ago. Since we started that, that was something that kept coming up and we wanted to help solve that,” Amber Willeford said. As for changes to decorations, net lights were added to most of the rocks in Fort St. Clair. There are 225 rocks in the Fort and now almost all of them have net lights. True icicle lights were added to Santa’s Cabin as well. Approximately 40,000 additional lights were added to Whispering Christmas this year. “[The net lights] were an idea from the previous committee members. The rocks are in areas where it is typically darker, so it is to help with traffic as far as where the edge of the lines are. The net lights will help with that,” Lewis Willeford said. “Some of the trees we have decorated this year, we’re trying something new with them. Instead of wrapping all of the trees, we’re staking them out to make them a mega tree. That brings more light into areas too and gives us the opportunity to brighten up some areas that need it,” Amber Willeford said. Santa’s Cabin also has all new LED lights, making the area a lot brighter and easier for servers. Another major change to the cabin in the lanterns on the table, which are also LED now. There is added signage for clarity and directions. The community has also rallied around the Whispering Christmas Committee to donate food for the volunteers. Meals have come from: McDonald’s, Pizza Hut, KFC, Vancrest, Papa John’s, Arby’s, Needler’s, and Kroger. “It was a little bit overwhelming at first, but we had great guidance. Everyone has been super helpful. Fortunately, they are all still involved and able to give us advice. Everyone has been very receptive to anything that we want to try or change. That has worked out really well,” Amber Willeford said. “Dean [Wigger] has given us a warning the past couple of years, that he was ready. We knew it was coming. Last year, he introduced us as the people who will take over. The last few years, we were thinking what we would do when we take over and had a chance to plan,” Lewis Willeford said. “I don’t think a lot of people understand that [Whispering Christmas] is all volunteer run, but we have a lot of support from the City of Eaton,” Amber Willeford said. “We want to thank all the Whispering Committee Members, the many volunteers that come to help decorate each area of the park, the servers, Santa, Mrs. Claus, and elves. Also, the City of Eaton, our great Eaton Police team. And new this year the Battle of the Business groups: Silfex with the entrance, Reid Health Urgent Care of Eaton with Breast cancer awareness section, Parker Hannifin with the playground area, and Henny Penny with the exit area,” Lewis Willeford said. Whispering Christmas is open now through Dec. 31 for drive through. The cabins are only open Dec. 1 through Dec. 24. Santa is in the cabin every Wednesday, Friday, Saturday, and Sunday now until the week before Christmas, when Santa is in the cabin every day except Christmas Eve.